The San Fernando Valley/Ventura Country repair service comments on a recent article that the best way to save money on the purchase of an appliance is to keep the one you already have. DG Appliance Service can come to the rescue on a 24/7 basis. Take advantage of the services of skilled repair professionals who are factory trained and who fully understand how to repair your particular appliance. A May 5 article in the Watertown Daily Times offers ten tips to saving money on the purchase of a new appliance. San Fernando Valley based DG Appliance Service says that it definitely makes sense to shop around for the best possible deal on a new appliance. 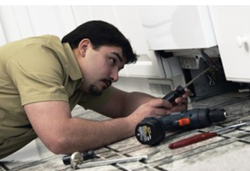 However, the repair shop adds, once a customer has bought it, the best way to maximize money over the long term is to avoid the waste and additional hassle of replacing that refrigerator or washing machine, and instead take advantage of the services of skilled repair professionals who are factory trained and who fully understand how to repair your particular appliance. DG Appliance Service notes that it is an authorized repair center for most of the popular brands Los Angeles area people are likely to own. These include LG Electronics, Samsung, Magic Chef, and Haier. Among the brands the shop services include Amana, Admiral, GE, Maytag, Whirlpool, Frigidaire, Hotpoint, KitchenAid, and most others. It adds that taking advantage of the skills of a factory trained repair professional means that repair work will last over the long haul. The service also says that its team members can explain to customers in plain English whatever the situation might be and what exactly needs to be done. The service adds that it can work with just about all of any home’s most important appliances, including refrigerators, dishwashers, stoves and cooktops, ovens and standalone ranges, washing machines, clothes dryers, and even microwaves. The services also notes that it regularly offers specials with major savings for select customers, so the money saved getting an item repaired instead of having it replaced can be even greater. DG Appliance Service notes that it’s not just the cost savings of repairing an appliance as opposed to buying a new one, it’s also the inconvenience customers can spare themselves. There’s a reason refrigerators tend to stay at apartments and homes through multiple residents over many years; replacing them is a pretty major hassle, says the repair shop. On the other hand, taking advantage of repair services is incredibly easy and convenient, especially considering that the shop’s team is available seven days a week and 24 hours a day. Would be DIYers should also consider that many customers only call the service after many hours of fruitlessly trying to make a repair on their own, or even accidentally making the problem worse. The firm suggests that potential customers consider skipping straight to having DG Appliance Service to take on a repair job. After all, time and energy is just as much worth saving as money. Readers who would like to learn more about DG Appliance Service are welcomed to contact the shop by phone at (800) 510-0811. They can also visit the firm’s web site at http://www.dgapplianceservice.com/. Areas served by the repair shop include Greater Los Angeles, the Western San Fernando, and Ventura County.